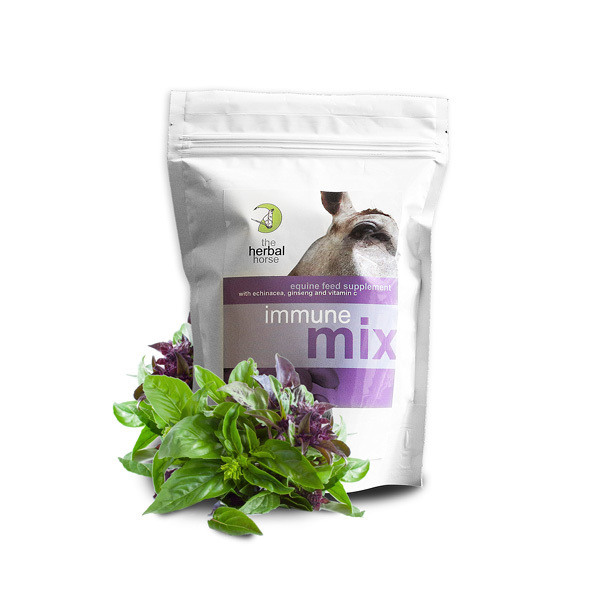 A unique blend of Echinacea, Ginseng, Vitamin C and other herbs, vitamins and minerals to support the horse’s immune system. I have been using the Immune mix on all my horses for the last 10yrs or so …. In that time I haven’t had any major illnesses. It also seems to promote hoof growth – my farrier is very happy with the hoof growth even in winter. We travel to shows alot and stable out as a result, and I feel this products provide a shield for my horses. I have also given friends some for their sick horses to try get them back on their feet quicker again with positive results. I have used this to help several horses with EEV – every one recovered well and stayed healthy afterwards. It has also helped biild the immune systems of the other horses and keep them from getting all these strange bugs and viruses which circulate periodically.